If you slipped into a coma (perhaps during “The Box,” which somehow managed to make a multicity terrorist attack boring), and “Head Games” was the first thing you saw upon opening your eyes, you’d swear it was January 2018. The episode is such a clean reset, it feels like a season premiere in almost every way. 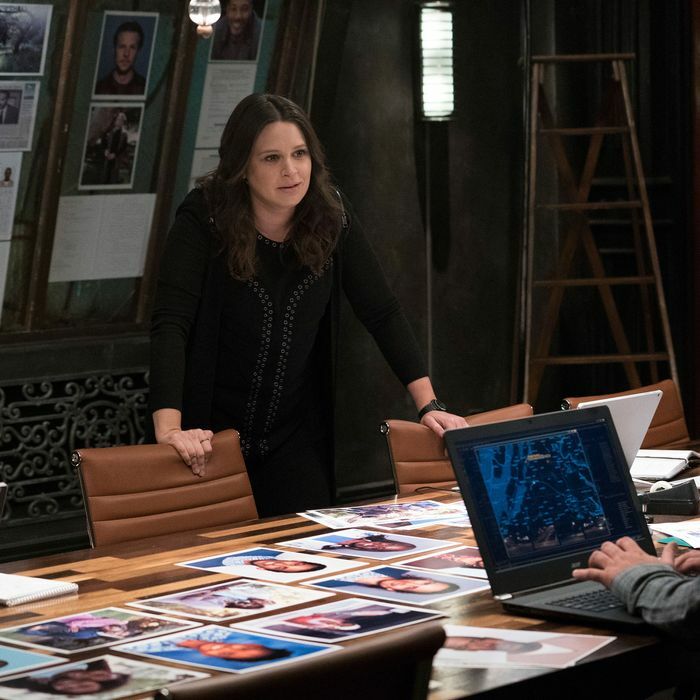 As if by magic, Scandal makes Peus and his Mystery Henchwoman vanish, then reboots its relationships and hurtles toward a version of itself not seen since early season three. The action is concentrated in the White House and OPA, and there’s even an honest-to-goodness case of the week. It’s like the good old days. But not everyone is out of the woods. Abby’s still having a hard time regaining her footing within the White House, with Fitz still angry about her role in the conspiracy to assassinate Vargas. He even tells her to work from home, like she’s processing accounts receivable, instead of helping to run the world’s highest-profile democracy. Compared to digging around in a dead man’s chest cavity, being the target of executive shade isn’t all that bad. David Rosen is nursing the love hangover he got from Mystery Henchwoman, whose name is maybe Gertrude, but now we may never know. Rosen drops in on Rowan, who’s preparing to flee to some island paradise, but is kind enough to give Rosen the closure he needs. At least, Rowan gives Rosen the raw ingredients of closure. For weeks, Rowan was manipulated with 11-pound boxes, but now it’s the ponytailed menace whose head is in a box, which he gives to Rosen as a DNA-laden parting gift. Rosen enlists Abby’s help, not to mention her freezer, and Jake swoops in to pull the evidence needed to identify the head. Like the best Scandal scenes, the characters are the first to acknowledge the fun absurdity of the White House chief of staff, the NSA director, and the attorney general playing hot potato with a severed human head. Quinn, Huck, and Charlie are also playing with someone’s life, after being tasked by Liv to find a criminal worthy of a pardon, with just nine days left in the Fitzgerald Grant presidency. They home in on Shaun Campbell, a man serving a life sentence for exacting vigilante justice against a white supremacist who killed eight people in a church bombing. The bomber is acquitted, but winds up dead, hanged from a tree, and somehow Shaun winds up taking the fall for it. The case is well-known, having been featured in a Serial-style true-crime podcast. The Shaun Campbell case is the kind of long shot that OPA used to specialize in, but this time, Olivia is too busy to run point, or even take much of an interest. (Charlie makes waves by suggesting the new Olivia Pope won’t have time for her old pet project.) She’s busy helping Mellie narrow down her cabinet choices, and strongly advising against Mellie’s instinct to recruit Marcus as her new communications director. Liv also has to have one last boozy dinner with Rowan, who is intent on retiring, not only because the Vargas ugliness is now behind him but also so he can avoid distracting Liv as she prepares to retake the Oval. The last thing Olivia needs are more distractions, so she’s none too pleased to find out Shaun Campbell is the man the OPA team has chosen for the president to pardon. Olivia was looking for something tidy with little chance of political blowback, not a racially charged, high-profile revenge killing for which Quinn can provide no evidence of Campbell’s innocence. Quinn, Huck, and Charlie already tracked down a racist barkeep who immediately confessed to the crime, but that’s not even the point. Quinn’s gut is telling her Shaun Campbell needs their help, and she’s furious when Olivia is too beholden to the White House to stick her neck out for a little guy who got a raw deal. That’s what OPA is about. Or should I say, QPA, which certainly doesn’t have the same ring to it. Quinn goes over Liv’s head and successfully pitches Campbell to Fitz in a terrific scene. When Olivia and Quinn debrief, Liv confesses that the whole thing was a test to see if she was ready to take the reins of the company that bears her name. Quinn passed, and the torch is formally passed down. The timing is perfect, since now there’s a bigger threat bound to absorb all of Olivia’s mental and emotional resources. During their quest to identify Mystery Henchwoman, Abby, Jake, and Rosen discover that Peus and What’s Her Name weren’t atop the chain of command. They were taking orders from someone else. Even if you missed Khandi Alexander’s name in the opening credits (which is an absolutely rookie move for a show that so values surprising the audience), “Head Games” gives an early clue as to who’s about to emerge from the shadows. “If you knew how it felt to be used,” says Rosen, as he pleads for Rowan’s help. “Someone pretends to love you, then uses you to torpedo democracy.” Rosen, you have no idea. Rowan knows all about being seduced and destroyed, which is why he’s the only person who can help take down the resurgent Maya Pope. So much for retirement.